ReachAcross is dedicated to sharing the Gospel with Muslims and serving them in practical ways. We are passionate about bringing the Word of God and the practical love of Jesus to unreached Muslims, no matter how difficult or inaccessible they may be. We hope you will consider partnering with us! 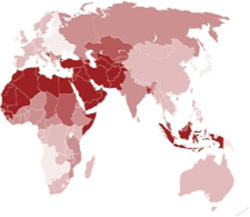 Most Muslim peoples are located within the 10/40 window – the rectangular area of North Africa, the Middle East and Asia, approximately between 10 degrees north and 40 degrees north latitude. This area has one of the highest levels of socioeconomic challenges. Our mission workers are often in vulnerable situations. Pray for them here. Is it easy to befriend Muslims? What may stop people from engaging? Click here. Are you in college or university and interested in getting to know Muslims? Join our REACH Summer Internship program!